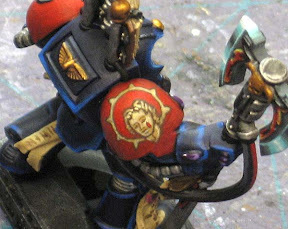 Lots of time we talk about how to do freehand and even when to do it, but it's not often we talk about "mapping it out" and figuring out how you're going to actually get your complex artwork onto your model. Sure you can break most freehand designs down into simple shapes and you can figure out when to do it, (before or after weathering and shading and such), but sometimes you have an image that is a bit more complex than that and you've got to figure out how to transfer your image (which is more than a simple design) to your model. I use two methods when it comes to mapping out freehand images onto models. I'm not including the process by which I do banners since that is it's own process and not really applicable here. For those looking to see that technique, you can check out the complete step by step here. Like we mentioned, most of the time, it's just a matter of combining simple shapes in the right order, but when you have an image more than you have a design, you have a new problem to work through. 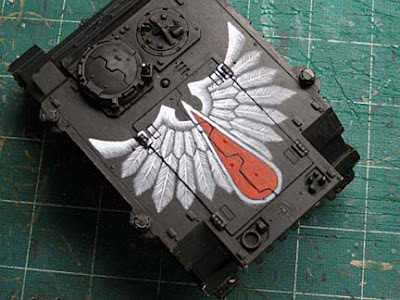 For the sake of this post, I'm going to stick with adding freehand to vehicles. I'll touch briefly on infantry models at the end, but the focus will be on larger models here. This works best when your image will fit on or within an area that is flat. The first thing I do is get a few measurements of the area for me to work in. Once I have my allowable size, I sketch out my design. 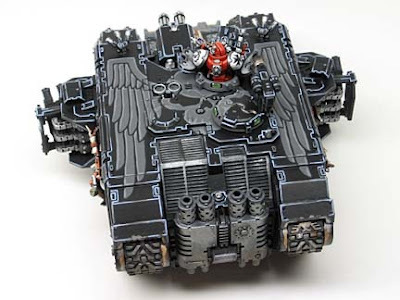 With the Blood Angels Rhino up top, this is the perfect example. The top surface of a Rhino is nice and flat. 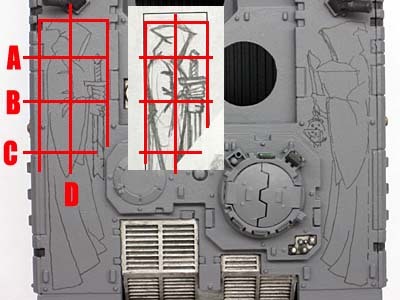 In the example below, I decided I would add two small drawings to a Land Raider keeping them limited to the flat surfaces on each side over the tracks. Since the image is being put on a flat surface, it's really a quite simple process. 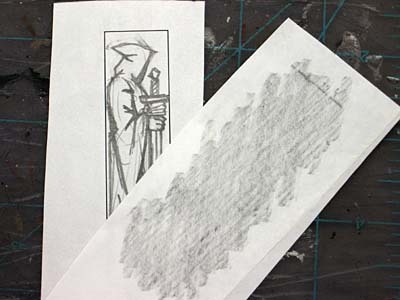 Once you have your line drawing done to scale on paper, flip it over and cover the back with graphite from a pencil. This in effect creates cheap transfer paper. 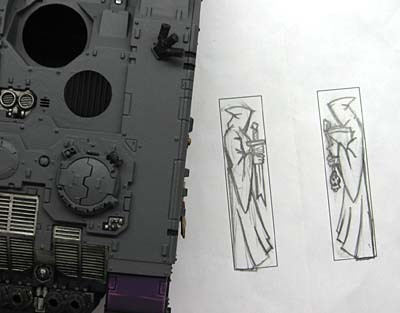 With a good coating on the back, flip it back over, lay it directly onto your model and use a ballpoint pen to trace the image onto the model. This leaves a light pencil outline on the model you can use for reference. Sometimes I'll use the pencil outline to paint in as is and sometimes I'll go directly over the light pencil outline with a thin black line marker (fine tip technical drawing pen). If you do redraw the image on the model with a pen, make sure you use waterproof ink so you don't get any smearing when you go to paint it. This method is the least preferred of the two as it doesn't give you the ease of drawing it out on flat paper and then transferring that onto the model. It's for those times when you have too many objects on the surface or it's simply too uneven to get paper down onto it to go over with a pen. 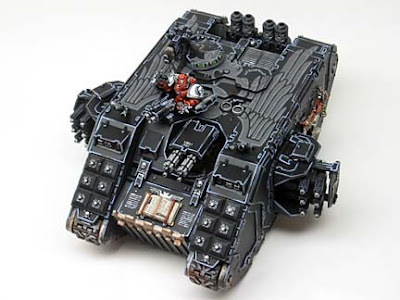 I'll apologize in advance as I do not have any better pics of the Land Raider below. You can see that the freehand goes over the entire back of the tank and over hatches and everything else up there. There was no way I was going to get any kind of paper to lie flat enough for me to trace my image directly onto the vehicle. This meant I had to draw it on the model and skip the ease of transferring it. You start out the same by getting your measurements for the area you want to draw in. In addition to measuring the outline of the area, you need to mark off some key landmarks for reference. I'm going to use the same artwork as above since it's all I have at the moment, but I think it will still explain the process. You measure out the outline of the area you'll be working in, you pick a few key landmarks horizontally (A, B, C) and some vertical ones (D) as well and get all that laid out. Do your drawing on your makeshift "grid paper." Once you have your drawing complete, the tough part begins. Setting your paper next to your model, you can make a few tick marks on your model with a sharp tip pencil to represent where the grid would be and you set out redrawing your artwork directly on your model using your grid as reference. When you look at the top hand on the sword, it falls within the second grid down on the right hand side. It rests on the line between the second and third grid blocks. You in effect break your image down into smaller blocks that you redraw on your model one at a time. This way, it's easier to redraw and keep everything to scale without the fear of something getting redrawn too big or at the wrong angle and not lining up correctly. You will get some slight variations as you redraw the image, but it will be fairly close. Then it's a matter of painting it. Again, the trick is to draw one "block" at a time and use your reference points to keep everything sorted out. This is where it can get real tough. Just the size of the area alone limits how much you can do when it comes to work on the front end. Add to that the problem of the surface area being curved or odd shaped and you'll be hard pressed to be able to "transfer" your image. Most of the time, I find myself redrawing the image onto the model directly. I will still draw the image out to make sure I know how to do ahead of time (even if it is larger than I'll be using) and I may even try and draw an outline of the shape I'll be working within so I can orient myself with the model. I have tried a practice run or two before as well to see if any problems crop up in the process of painting the image. The idea is to try and anticipate any problems ahead of time so that when you sit down to put paint on your final model, you have a good idea of how it's going to go. Highly detailed freehand on smaller troops in really something all together different. With this, it becomes much more important as to when you do the process. And the room for error is usually much less. That shouldn't prevent you from trying, you just need to be prepared. As you scale down in size, you need to be able to represent things with a "shorthand" because of the limited space available. That requires a good knowledge of the subject matter in addition to the appropriate techniques in order to convince the viewer. Hi, I often read your blog and find alot of your painting articles really useful. 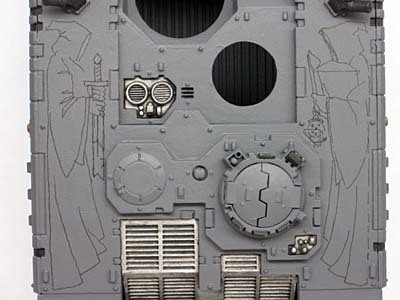 I want to do free hand on my grey knights like the emperor model (http://www.dakkadakka.com/s/i/at/2009/11/14/ed257b2107398d82e2842d790f5053a4_20700.jpg__thumb) Mike Mcvey done back in the late 80's. Any advice? Fantastic advice, now I know where i went wrong on my vendetta! Many thanks! Very interesting. I will need to give something like this a shot when painting models that have some area to do this in! The basic techniques are the same ones Iused to use in high school art class when I was using the gridding method to blow up comic book art. I can do that! Thanks for the article. Invaluable! Another great article to go with all the others...and why FtW is one of my first stops when a hobby question comes up. Thanks for posting, keep it up! Thanks guys, glad it helps some. I'm doing a bit of conversion work in the coming weeks so I think a few greenstuff articles will be in order soon. Anon: I can't get the link to open, I'll try again on another one later to see fi Ican get to it. If you want to email me, that would work too. Seriously, everytime I read one of your posts I'm like "WOW, that's a clever idea"
I'll just add this to my list of references next time I freehand something. Great walk through on how to do some freehand work on a model. Would it work to do this: take a top down picture of the bumpy model. Trace the outlines of each bump, then copy that sheet. Draw your art on the copy. Make another copy, this time of the sheet with the art and bump outlines on it. Then, cut at the outlines of the bumps, and turn those pieces into transfer paper. Then all you're left with is painting the edges of each bump? For example: (Not that it'll be this simple normally, but it's an example) You've got a large square, with a rectangular area in the center. So, you draw the art after doing all the intermediate steps, and then do everything you need to before slicing it up. That way it means that you can transfer at least part of the design. about to do some freehand on my rhinos and this was a huge help. Thanks a ton! That is just marvelous and makes your models stand above even other nicely painted ones. I think I will have to at least attempt this. Excellent article, it may have just convinced me to give my own free hand a try! Cool, I'm glad this one helped as much as it has. Thanks for kind words guys! C'nor (Outermost_Toe): Sounds like a huge amount of work. That being said... if it's a process that you can wrap your head around and it makes sense, then go with it. Whatever it takes to get the end results you're looking for. Good stuff! Thanks for sharing. Never would have thought of the self-made transfer. The self-made transfer is a winner! Thanks Ron. I linked this post up on my blog. I used your self-made transfer technique and wanted to give you credit. Thanks again for sharing. Your blog has really improved the hobby for me. Feldmarshal: Excellent, glad it helped and thanks for the link too! I linked you up again. Thanks again for contributing so much to my hobby enjoyment. Feldmarshal G: Looks great! And I bet you thought freehand like that would be impossible to pull off.